A Quiet Night – What’s that all about then? Well it’s about an amazing adventure covering the work of east London’s emergency services, which has been credited with starting the “Fly on the wall”, emergency services documentaries that are so popular today. 5:30 am on a cold, wet morning at the wrong end of September. Like a knife, the shrill alarm prodded me awake. I didn’t want to move but, as I rolled over, I remembered that no picture editor had sent me to do this. It wasn’t for a newspaper (or the money). No I was doing this for an “exhibition”: after all these years I still wanted to be a “serious photographer”, a maker of gritty, emotional black and white images. It was actually MY idea. “You must be bloody mad,” I thought, as I forced myself out of bed and into the shower. 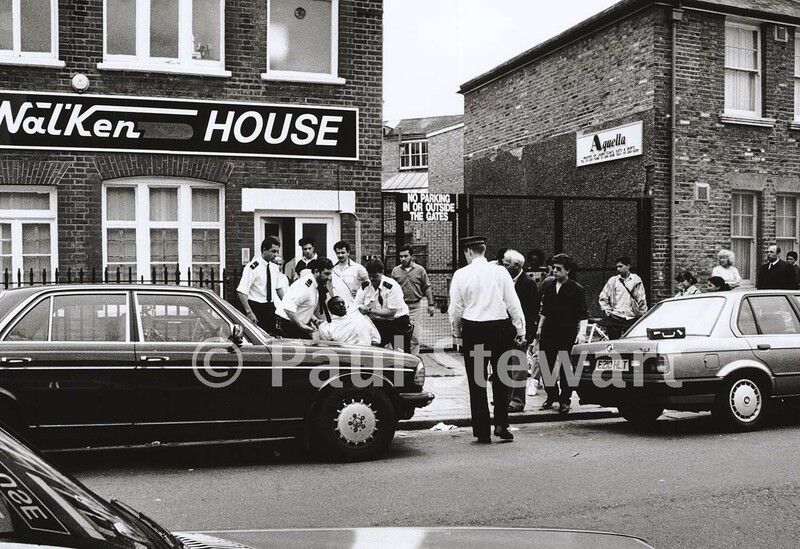 Twenty five minutes later, cameras checked and film loaded, I was on my way to Stoke Newington police station. Thirty minutes after that and I held on for grim death in the back of area car Gulf-4 as with “Twos and Blues” flashing and blaring P.C. “Junior” Reed hurled us out into the early morning traffic in a white knuckle ride to end them all, our first emergency call of the day. 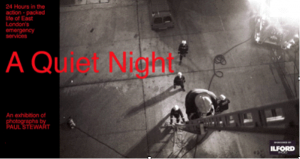 My “Quiet Night” had begun…….. Why is it called “A Quiet Night”? Well when I was at the old Homerton Ambulance station, (originally built as a prison to house POWs in the Napoleonic wars), waiting for the vehicle I was going on a night shift with to return as the previous crew were still, out on a “Shout”. One of the paramedics said to me “well you’ve picked the right place to do it, a quiet night in Hackney is a busy night anywhere else”, I had my title. 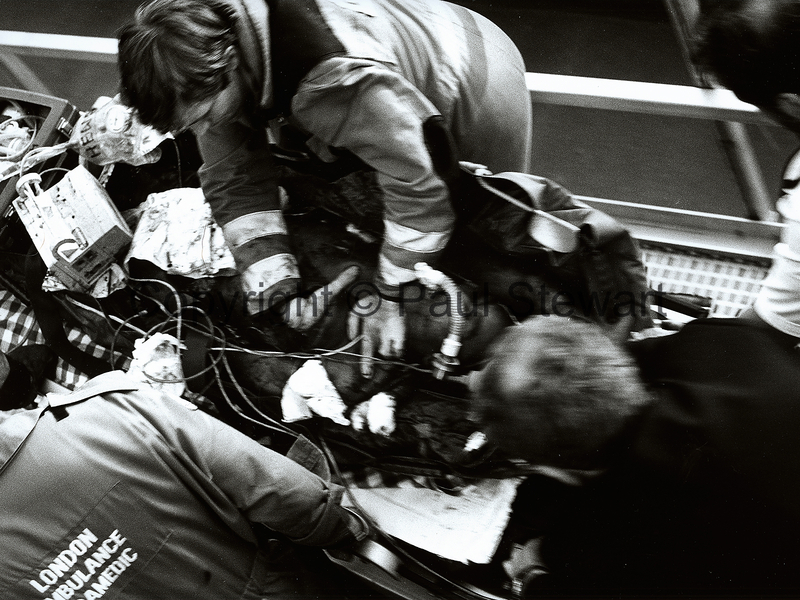 Thanks to the then unprecedented access given to me, I saw the dramatic, like open heart surgery of the roof of the Royal London Hospital, unarmed police overpowering and arresting an armed robber and the like. 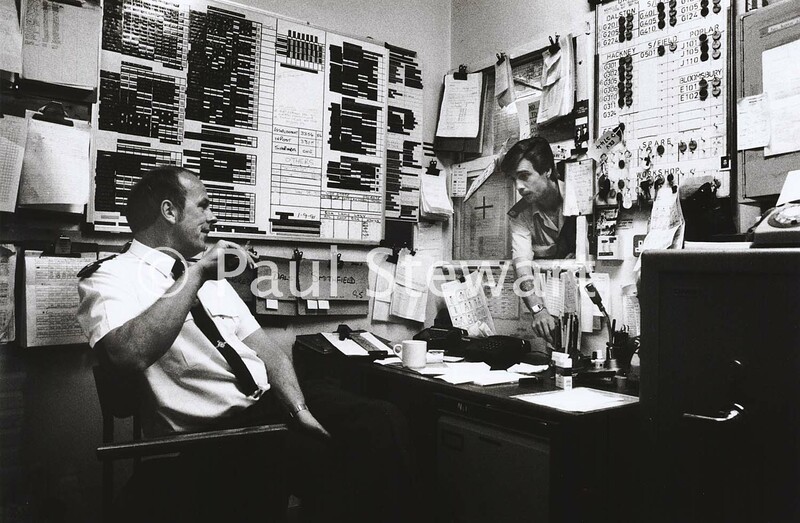 I also saw the gentler side and the transition from the old manual dispatch systems to the state of the art, Computer Aided Despatch (CAD) systems used today. There was tragedy but, there was humour, like going to the aftermath of a party in where a man’s ear had been almost hacked off with a machete. To put him at his ease, the paramedic asked “Good party”? “Yeah man, wicked till this happened”! several locations around The UK, opening at the Hackney Museum, then going to Counter Image Gallery in Manchester before touring colleges and universities. Images from it were also used in the book ” A Hackney Century” (ISBN 10: 0750923032 ISBN 13: 9780750923033) and a number of magazines and newspapers. 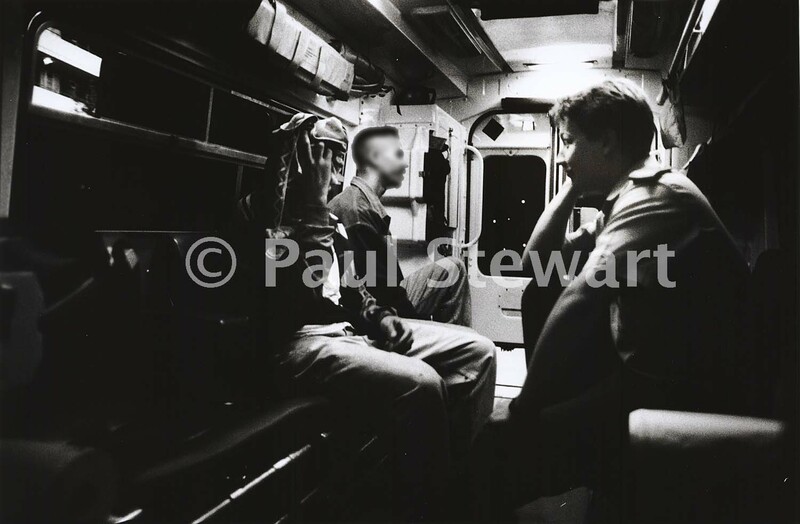 Paul Stewart would like to record his thanks to The Daily Express and HEMS, the London Helicopter ambulance, the London Ambulance Service, Roger Walsh, Danny Dwyer and the London Fire Brigade, Roy Clarke, CBE, QPM and the Metropolitan Police for making this possible. My thanks also go to Ilford Photographic for the sponsorship and Alan (AJ) Jefferies for printing it. Dramatic moment as Dr Mike Walsh of London’s Helicopter Emergency Medical Service(HEMS) performs open heart surgery on the roof of the Royal London Hospital. The patient is a stabbing victim who has just arrived aboard the helicopter.